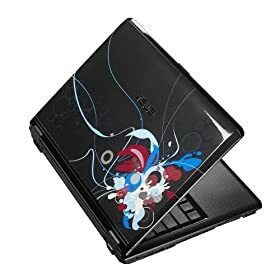 ASUS F6V-C1-Black 13.3-Inch Laptop (2.26 GHz Intel Core 2 Duo P8400 Processor, 4 GB RAM, 320 GB Hard Drive, Vista Premium) ; ASUS F6V-C1 (black) notebook has high glossy LCD cover, with Cologne-like fragrance; With only 13.3 inches, F6V carries full solution such as: fashionable design: unique pattern and scents on LCD cover, elegant texture on palm rest; performance: graphics power: ATI HD3470 256MB VRAM; connectivity and security: Fingerprint reader, Bluetooth, e-SATA, TPM; entertainment: HDMI port, 1.3M pixel web cam. Experience data transfers of 5 Gbps of bandwidth and the upgrade options for future enhancements and requirements. Messy cables behind your device will be a thing of the past. With HDMI, the industry standard digital interface, a single cable will support standard, enhanced, or high-definition video and plus multi-channel digital audio.